A few lines and wrinkles, less velvety skin, less radiant, loss of firmness….. all signs that time is passing by. THE SKIN AGES ... WHY ? Day after day, time leaves its mark at different rates which shows that we are not all created « equal ». Skin aging is there to remind us in a visible, sometimes cruel way. Many factors are responsible for these changes, from lifestyle to genetics. Marks of time vary during one’s life. From 25 to 50 years of age, the skin gets thinner, weaker, loses its radiance. Its natural brightness tends to decrease. Around the age of 50, lines become more pronounced, the skin is not as firm, facial contour less even, the neck less tight. These marks of time are caused by a change or a gradual decrease in collagen fibers, elastin, hyaluronic acid and the dermis fundamental substance, together with increased skin dryness. Skin aging obeys the same rules as other organs but the skin is also exposed to specific aggressions (tobacco…). Repeated free-radicals (oxidizing agents) attacks from UV exposure add to cell metabolism slow down as part of the aging process. As a consequence, certain areas (face, neck, back of the hands, forearms) age more quickly. While we cannot slow down time or avoid stressful events in our lives, we can have an effect on photo-induced aging (caused by skin exposure to UV rays). Actually, one has to be careful with overexposure to the sun starting early in life. But it is never too late to start. Photo-aging means photo-protection, that is to always be careful about sun exposure: Do not spend much time in bright sun, wear clothes, a hat and sunglasses (that carry a UV label), use high SPF sunscreens. Of course, don’t forget that a child under the age of 3 should NEVER be exposed to the sun. • Some retinoids are topical medications that require a prescription. • Others like Retinaldehyde are classified as dermo-cosmetics and are available without prescription. 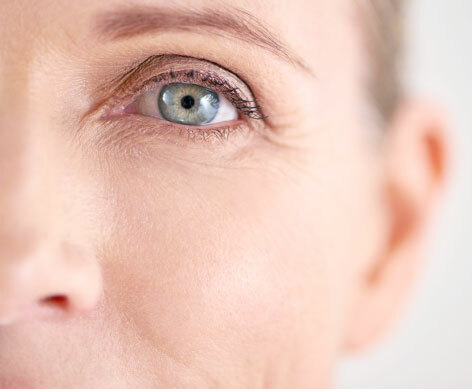 Through a physiologic conversion into active vitamin A, based on the needs of the skin, Retinaldehyde works deeply to boost cellular metabolism and on the skin surface to brighten the complexion. 2 Hyaluronic acid A major component of the skin matrix, it is synthesized by the cells of the epidermis (keratinocytes) and of the dermis (fibroblasts). This synthesis decreases with age. However, the support role of hyaluronic acid is critical: It ensures skin suppleness, elasticity and its hydration. Today, dermo-cosmetic products are available to compensate for this decrease by increasing Hyaluronic acid concentration in the skin. What are the current techniques in dermatologic surgery? - Botox injections for deep expression wrinkles. - Cosmetic surgery: In some cases, face and neck lifts, eyelid surgery (blepharoplasty), are justified. The decision to use one technique over another is based on individual consultation. There are differences in skin aging, expectations and needs. Does menopause play a part in skin-aging? At menopause, there is a cessation of ovarian secretion, including estrogen which plays a positive role on skin tone and thickness. Therefore, menopause is one of the factors in skin aging but less important than sun exposure. Is tobacco a factor in premature skin aging? It is proven that smokers experience skin changes that lead to premature skin aging: wrinkles, yellow complexion (more reasons to stop smoking or not start). What about vitamins and minerals ? Many dietary supplements contain vitamins, amino acids and minerals and claim anti-aging properties, usually through protection from free radicals. Is skin aging unavoidable ? Yes, indeed, it is impossible to have the same skin at 60 than at 20. However, what we discussed earlier makes it possible to correct consequences of skin aging, specifically related to sun exposure. So keep smiling, an excellent anti-aging! Why is it so important to moisturize our skin? In time, the skin loses its structure. As a result, it gets dehydrated more easily, more fragile and it is more vulnerable to external aggressions (climatic, pollution, ill-suited skin products …). It is therefore necessary to moisturize it using the right dermo-cosmetic products and restore its defective hydrolipidic film.